At just 21 years of age, Ana Carrasco (DS Junior Team) has made history in the FIM Supersport 300 World Championship as she secured the world title in the final race of the season at Circuit de Nevers Magny-Cours. Becoming the first female to secure a world title, her performance this season has been nothing short of stunning, and it will be one that won’t be forgotten in a while. Beginning her career in 2011, the Spanish sensation began in the CEV 125 championship and her points scoring performances saw her secure a seat in the Moto3™ World Championship for 2013. Making the move over to WorldSSP300 in 2017, she has been showered in success. Returning to the scene of her historical debut victory, Carrasco signed off the title with an impressive fight in France. But she hasn’t had a totally smooth season, which makes the achievement an even stronger one. In an unpredictable championship such as WorldSSP300, her tenacious racing nature and skill have got her to the top. Beginning the season at MotorLand Aragon, the Spaniard took a top six finish in her debut with the DS Junior Team but was only 0.4s off the race winner. With a strong pace established on-board the Kawasaki Ninja 400, she then headed straight to Assen with points to prove. Crossing the line in fourth position around the historic circuit, she was again just over half a second behind the race winner as the unpredictable nature of a final WorldSSP300 lap can make for a difficult race. But it was the third round of the season around Autodromo Internazionale Enzo e Dino Ferrari di Imola that ignited her title chances, winning the 11 lap race by a dominant 11 seconds over her rivals. Leaving them for dust, Carrasco put on a sensational performance under the Italian sunshine and left with a three point championship lead. Carrasco’s sensational form continued over to Donington Park, which is a very different style of circuit to Imola, proving her pace was there to stay. Crossing the line this time by a mere four seconds ahead of the rest, the 21 year old was looking unstoppable as they hit the half way point of the season. Stretching out her championship lead to 22 points, it was hers to throwaway. However, she faced two tough races in the upcoming rounds and it was a big challenge for the rider from Murcia. Only able to leave Automotodrom Brno with a top 11 finish, and Misano World Circuit Marco Simoncelli with a top 10, Carrasco entered the summer break with a 16 point championship lead and two races remaining. With strong memories of Portimao from her debut victory in 2017, she was ready for the battle and prepared to seal the title in Portugal. But the luck didn’t fall in her favour in the penultimate round of the season, and the fight continued on to France. Heading to the final round with a 10 point lead, Carrasco put on a memorable performance to prove she was the worthy champion. In an emotional display following the 12 lap battle, Carrasco will forever go down in history as she became the first female to take a world title, with a 13th place finish. Nita Korhonen - Director, FIM Women in Motorcycling Commission (CFM) : "This is absolutely great to have a woman winning an open circuit racing championship. Today Ana has made a historical achievement which will not only have an influence on herself but the whole motorcycling scene. Ana has shown that winning this kind of high level title has nothing to do with the gender but the talent. 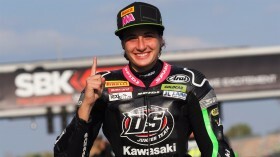 On behalf of the FIM I want to congratulate Ana for her title as FIM Supersport 300 World champion! " 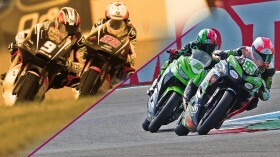 Congratulate Carrasco and celebrate the history maker using #UnstoppableAna and watch the #PinkWarrior’s stunning feats and successes with the WorldSBK VideoPass.